Sky Digital Explored – What Does Sky Offer? Sky offers the widest choice of TV channels in the UK. Here, we look at the various services and options offered, to help those of you considering signing up to Sky’s service. Sky offers the largest number of digital TV channels in the UK, and the largest number of HD channels around. It also offers an unrivalled movies and sport service, and the award-winning Sky+ recorder. Sky’s available to 98% of the UK, and obviously, you’ll need to get a satellite dish fitted to enjoy Sky. Once installed, you’ll get hundreds of digital TV and radio channels, many in stunning HD. With Sky Digital, you’ll get some top TV channels, such as: Sky One, Sky Atlantic, Fox, Sky Living, G.O.L.D, Disney, Cartoon Network, MTV and Universal. There’s also a huge choice of movies, plus Sky Sports, Sky Sports, ESPN and Eurosport. Sky has two main viewing packages, with prices starting from £21.50 per month. Extra channels, such as Sky Movies and Sky Sports can be bolted on separately. How do I get Sky Digital? To get Sky, you’ll need to have a satellite dish and a Sky+ box installed at your home. You’ll need to sign up to either the basic ‘Entertainment’ package of channels, or the ‘Entertainment Extra’ package. You can order Sky online – when you book, you arrange an installation appointment (including Saturday and Sunday installation). One of Sky’s engineers will turn up and install the Sky dish and digibox, connect it all to your telly, and set everything up for you. If you order Sky online, you can take advantage of the following offers. Free Sky+HD box, free standard set-up and an M&S Voucher with the above offer! Six months free unlimited Sky Broadband – No download restrictions, or slowdowns at peak times – Available to new and existing Sky customers! Details at www.sky.com/shop – Weekend installation available! Hundreds of digital TV and radio channels – Far more channels than you’ll find on cable TV or Freeview. See Sky’s packages. Sport – Unrivalled sports coverage with four Sky Sports channels, Sky Sports News, plus Eurosport , ESPN, Racing UK and attheraces. Sky’s a must for football, rugby and cricket fans. Extras: Sky offers the widest choice of High-definition content in the UK, as well as their revolutionary Sky+ digital video recorder, the UK’s first 3D channel and the Sky Anytime on-demand service. When you sign up to Sky, you need to select either the basic ‘Entertainment’ package of channels, or the ‘Entertainment Extra’ package of channels. There are optional “premium packs” (such as Movie or Sports channels). You’ll also get a number of free-to-view channels as well. Full details of Sky’s channel packages at sky.com/shop/tv. The Sky+ PVR combines a satellite receiver with a hard-disk recorder that lets you record 180 hours of programmes and movies. The Sky+ box allows you to watch one satellite channel while recording another , and pause/rewind live TV. Sky+ supports Series Link, so you don’t miss an episode of a series you’re following. The hype is actually true… Sky+ will change the way you watch TV. You can even use your mobile phone or web browser to set programmes to record. Sky+ is available directly from www.sky.com. More in our dedicated Sky+ section. 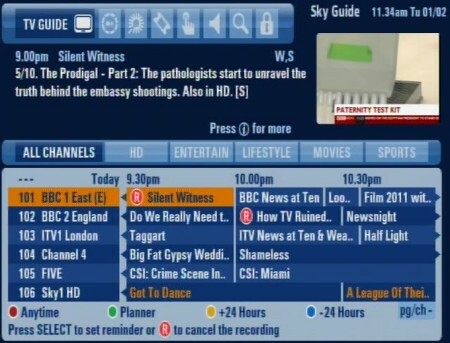 Freesat – This service launched in May 2008. Freesat from Sky. Around 240 free-to-view channels for a one-off payment of £175 to Sky, with the option to subscribe to premium channels later. Free to air – A number of digital TV and radio channels can be viewed on a satellite receiver without a subscription or a card. For a list of the free channels that can be viewed with a Sky dish and decoder without subscription, see Sky Free-to-air. Details on our Free to view satellite TV page. Can’t get Sky? 98% of the UK can get satellite TV, but if you can’t get a Sky satellite dish where you live, or don’t want to pay for Sky, see our page of digital TV options. When recording programmes from Sky television (all have the same title e.g. Benidorm ). Instead of having several headings and several ‘boxes’ of the same title, would it be possible to lump them all together under one heading, with all the episodes following on after each other, instead of being spread all over. How do I find Radio4 extra? I can see all the other radio channels but not this one. Sky have just changed my old box to a newer wireless enabled one. The old box had several aerial slots on the back and the tv in the adjoining room got its aerial from one plugged into the old sky box. With the new box installed there are no spare aerial sockets and so I was told to get an IOU adaptor and put it into the I/o slot on the back of the box. I bought an I/O modulator from Maplins today after explaining this – but it doesn’t work. Is there any way I can make it work like the old box and connection. I don’t particularly want to watch Sky in the other room but do want to watch normal channels like BBC. The tv in the other room is also linked to BT vision and now says there is no aerial input although the internet connection is working and I can get On Demand etc.